Political events are held in front of thousands of people. They often take place outdoors and although they are meant to attract those who align with the ideas of the political party in question, they can be a target for those who don’t agree and fanatics. Unfortunately, there’s no way of knowing exactly who will show up at a political event, no matter how tight security is. For this reason, security guards are hired to protect politicians. If you’ve ever seen a political event on TV or in person, you’ve probably noticed that security guards seem to be constantly scanning the crowd. This is because they need to spot any potential threat before it’s too late. Security guards go through extensive training in which they are taught to notice anything and everything whether it’s out of the ordinary or not. For example, someone in the crowd reaching into their jacket pocket will be regarded as a potential threat until it’s known what they are reaching for (probably their phone). Security guards are adept at assessing danger. If a potential threat is spotted, it’s their job to assess the situation and see what level of danger is involved before determining a plan of action. Security guards are also first on the scene, making sure it’s safe for politicians to step on stage, move through a rope line (a roped off area where people can shake hands with a politician), and enter vehicles and elevators. Another part of the security guard’s extensive training regimen is learning how to remain calm in any situation. No matter how dangerous it may be, security guards remain calm in a crisis to ensure that the person they’re in charge of protecting can be moved safely out of harm’s way. Another reason security guards remain calm during an emergency is to keep everyone around them from freaking out and causing more chaos. Having security guards assigned to political detail can mean the difference between life and death. 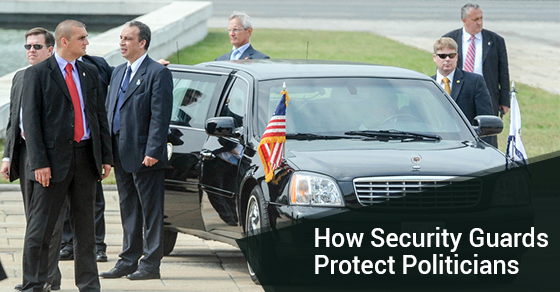 If you are looking to hire a reputable security company to protect politicians, pundits and other high-profile individuals, contact us today.